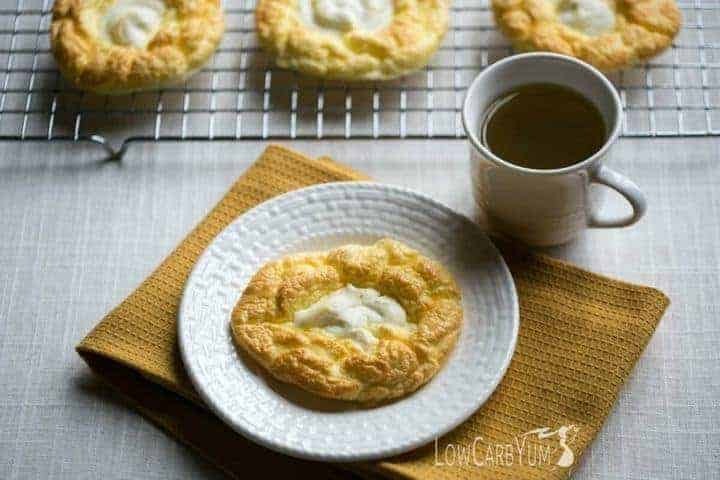 An egg fast friendly cloud bread cheese danish recipe that’s super low in total carbs. It’s a nice low carb treat to enjoy any time of day. After finishing my extended egg fast, I have been maintaining a five pound weight loss. I lost about seven pounds total. I did gain a couple pounds back after returning to regular low carb high fat eating. However, I’m still eating a lot of eggs and trying to keep my total daily carb intake as low as I can. 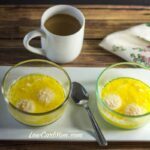 By egg fasting, I was able to recognize foods that tend to trigger weight gain. Fiber sweetener is a big one. When I came off of this last egg fast, I wanted some chocolate and snacked on some Lily’s chocolate chips. Big mistake! Those chips are sweetened with erythritol and inulin. The next morning, I woke up bloated with stomach pains. Most likely caused by the inulin, a fiber sweetener. Swerve also uses a fiber sweetener and it has a similar effect, but milder. The problem with erythritol is that it tends to make me overeat. Otherwise, it’s pretty safe. But, I need to cut back on the amount of erythritol I consume. The only safe sweeteners for me seem to be concentrated stevia and monk fruit extract. I’ve stocked up on those and will be experimenting with them more. During my egg fast, I made a lot of cloud bread. The bread is really quite light and airy. I thought it would make a perfect danish. 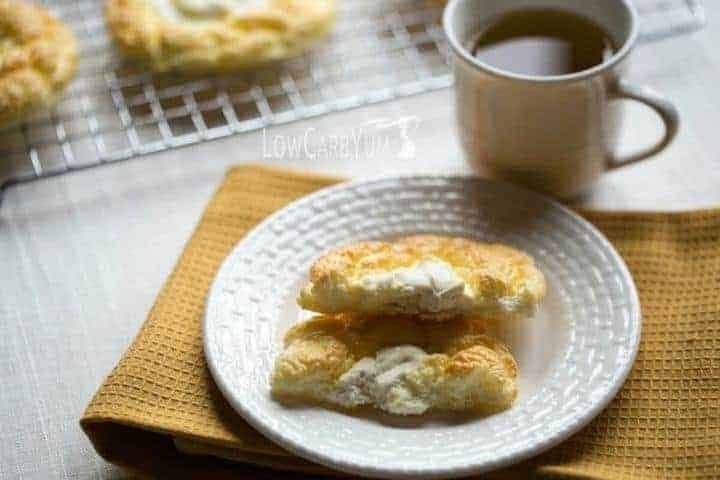 So, I came up with this cloud bread cheese danish recipe. It’s very low in carbs and egg fast friendly. Since whey protein is a primary component in Soul Bread, I used it instead of coconut or almond flour. This keeps total carbs to only 1.1g for each low carb cloud bread cheese danish. I didn’t have much time to experiment with this recipe. But, I may try just a little coconut flour next time and a bit of baking soda. The coconut flour and baking soda may give the pastry a better texture. I tried to keep the recipe as simple as possible as well as egg fast friendly. For the filling, I thought about adding an egg yolk as most cheese fillings do add that. But, I didn’t have an immediate use for the white so I just left that out. I will put that in as an option. 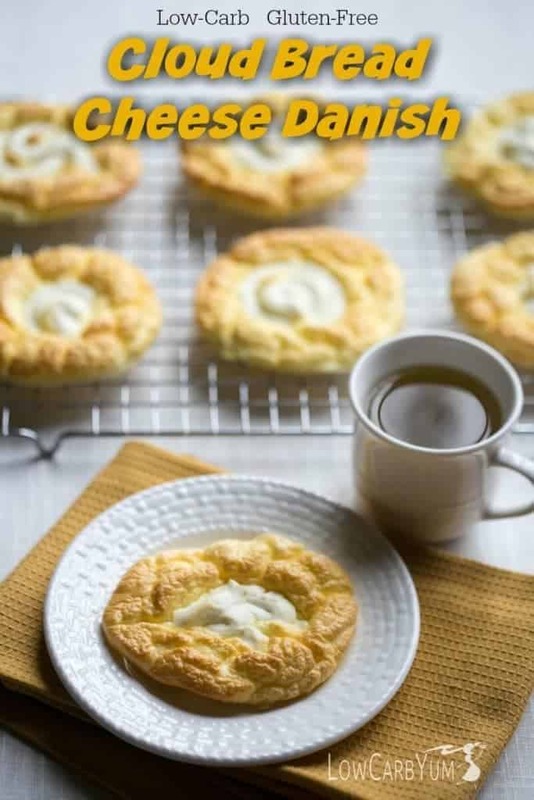 This cloud bread cheese danish recipe makes a dozen good sized danishes. I brought them into work and they were tasty and filling breakfast treats. They may freeze well, but I ate them all before I could test that out. I’m really in love with cloud bread lately. 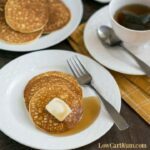 I’ve been following a low carb way of eating for a long time yet I just discovered this popular low carb recipe. 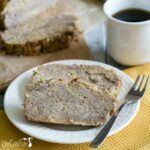 This is a great low carb bread option. I also see it as a perfect way to make a super low carb cake like this one. 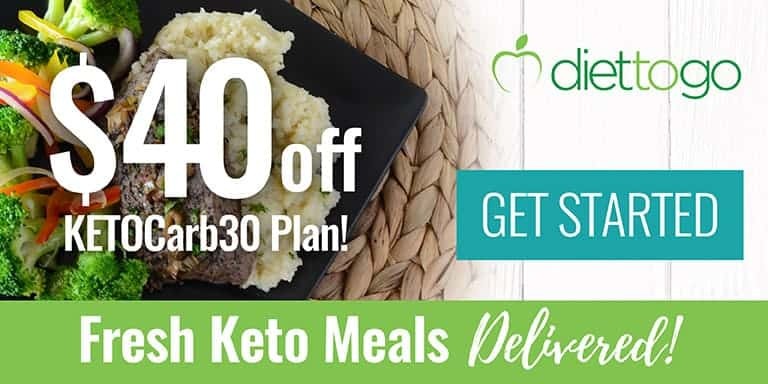 I really have to start watching total carbs rather than net carbs. So, you can bet that I’ll be experimenting more with the basic cloud bread recipe. Using eggs as the main component rather than low carb flours really cuts back on total carbs. 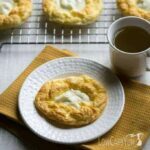 With this cloud bread cheese danish recipe, I can easily eat two danishes and not overdo my total carb count. Are you a fan of cloud bread? What’s your favorite cloud bread recipe? 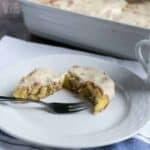 An egg fast friendly cloud bread cheese danish recipe that's super low in total carbs. 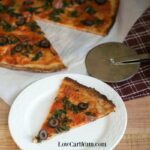 It's a nice low carb treat to enjoy any time of day. Preheat oven to 325F. Line two baking sheets with parchment paper. In medium bowl, stir together 8 ounces cream cheese and vanilla stevia (and egg yolk, if using). Transfer to plastic bag or pastry bag. Separate egg whites and yolks into separate mixing bowls. Add stevia, 3 ounces cream cheese and whey protein to yolks. Stir in optional coconut flour, if using. Mix until smooth. Whip eggs whites with cream of tartar until stiff peaks form. 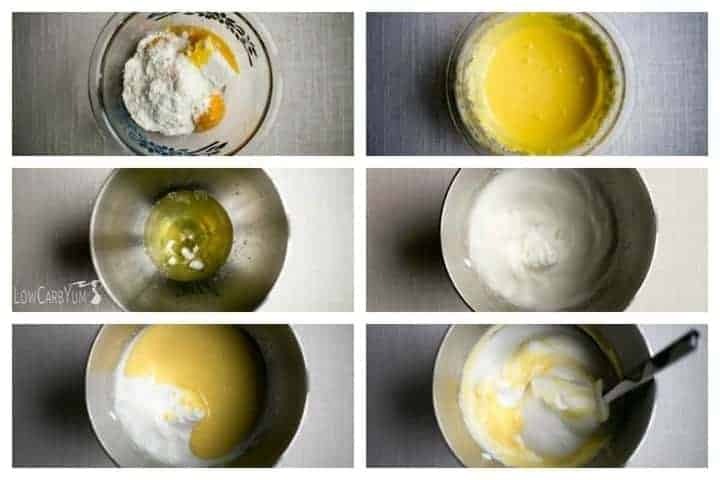 Gently fold yolk mixture into beaten whites. Spoon 6 mounds of the egg batter onto each prepared baking sheets (12 mounds total). Flatten each mound slightly. Pipe sweetened cream cheese onto the center of each batter circle. Bake at 325°F for 30 minutes. Nutritional data does not include optional ingredients. You need to provide more information. Perhaps the egg whites weren’t stiff enough or they broke down when folding the mixtures together? It’s really important to keep the egg whites fluffy when folding in. I just made my first cloud bread this week and used them for tacos, they weren’t bad. I’m really picky and really miss corn tortillas but am determined to find alternatives and stay on this low carb quest! I feel less bloated already and its been about 3 or 4 weeks. 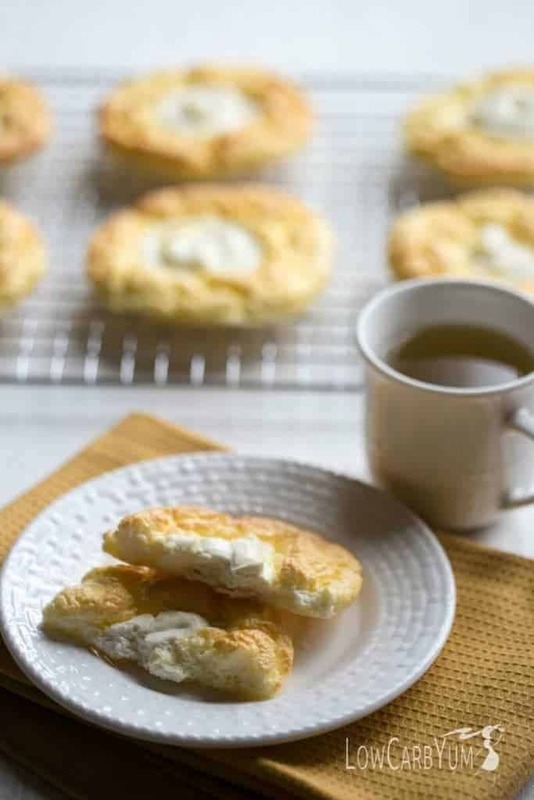 Anyway thank you for this recipe, I was thinking of a sweet donut-like cloud bread for this over night hike I’m going on and these look perfect with my morning hot tea!!! YUM! Just one question, I dont have the protein powder, can I sub almond flour cup for cup? It should work, almond flour is just heavier so the texture won’t be as light. 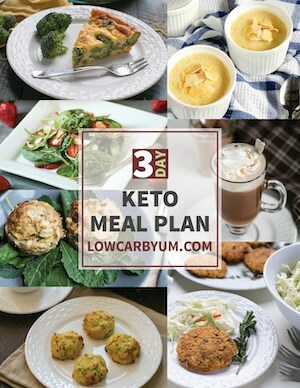 Hi Lisa, So baking has never been my strong suit, i’m new to Keto, 5 months in, and loving it. missing carbs once in a while, you pictures looked amazing. I just finished baking….so yum! my question is, my cloud bread was thinner and so baked quite flat….tasty but thin and flat. what do i need to add or subtract to get them to pile high, stay high and look like yours…..my husband, who is not keto loved them. thank you for this fun recipe! You’re welcome Sheila! And it’s great that your husband enjoyed them as well. The eggs whites need to be beaten till they form firm peaks and then you really need to be careful folding in the egg whites so the batter is fluffy. 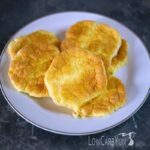 I have had cloud bread and is very good for Celiacs & low carb diets. I am definitely going to try this. I am thinking a little sliced fresh fruit on top. Thank you for your time in sharing this. What is the egg fast? See this egg fast diet plan post for more info on egg fasting. And berries would be a great add to the danish! Your welcome! Thanks for giving the recipes a try. Can you just use coconut flour instead of protein? Sounds great!! It should work, but you may want to use less coconut flour. When I saw the picture of the danish, the little squirty things under my tongue exploded! OMG that looks SO yummy! Is there a substitute for the whey protein? You could try adding an extra tablespoon of coconut flour instead. Is the protein powder ok for the egg fast? A small amount should be fine as long as there aren’t any carbs added. It’s a cloud bread which does take a little practice to master, but it should come out with a rise. Thanks Pam! Glad they worked out for you. In the ingredients list, where is says egg yolk optional. Is that supposed to be with the filling list instead of the dough? I ask because I read where you said some fillings have the yolk? 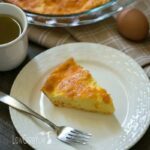 I was just wondering how you would incorporate the yolk into the filling? Then I saw that and wondered if there is also an option to put it into the dough? Thanks so much! This looks Heavenly! It is supposed to be with the filling! Unfortunately, I’m having an issue updating the code for the recipe so I can’t fix it until I get the software fixed. What can you use instead of whey protein? You can try gelatin or a little bit of coconut flour. I added 1/2 tablespoon of lemon juice to the filling and I used vanilla plus a liquid stevia–if I had monk fruit stevia liquid I’d have used it since I think the mix gives better flavor. I used EZ sweetz brand and it only required 1/4 teaspoon to sweeten. I also omitted the vanilla protein powder since whey protein spikes insulin. I will experiment with pea protein later but this time I opted for another T of coconut flour and 1/2 T of psyllium husk powder. Filling is more than adequate. Can’t wait for my first bite! It’s in the oven now! Thanks for sharing your tips April! I’m sure that bite will be worth the wait! Can you please edit your recipe to show the AMOUNTS of things that go into each element? Separate the ingredients out and then in the instructions. Say how MUCH cream cheese goes into filling and the dough, not just say “cream cheese”. I just read through he comments wondering why mine looked messed up and it’s because you were not clear on this. I’ll be copying this recipe to have the correct amounts but what a bummer, hoping once they cool they at least taste edible. Fixed! The ingredients are listed in order used, but clarified which is which. This was my first time having cloud bread. It was alright. Takes some getting used to I guess, this whole low carb bread thing. The cream cheese filling made it better. I added lemon juice to the filling and omitted the vanilla. It was kinda hard folding the egg whites into the yolk mixture cuz the yolk mixture was really thick with all the coconut flour and protein powder. Took a lot of folding to mix it well. Prob why they were kinda flat. I used 1/2 tsp of baking soda as well, but I don’t think it made much of a difference. They were still flat . . . not totally flat, but I was thinking they should have been thicker and fluffier. It does take some getting used to. 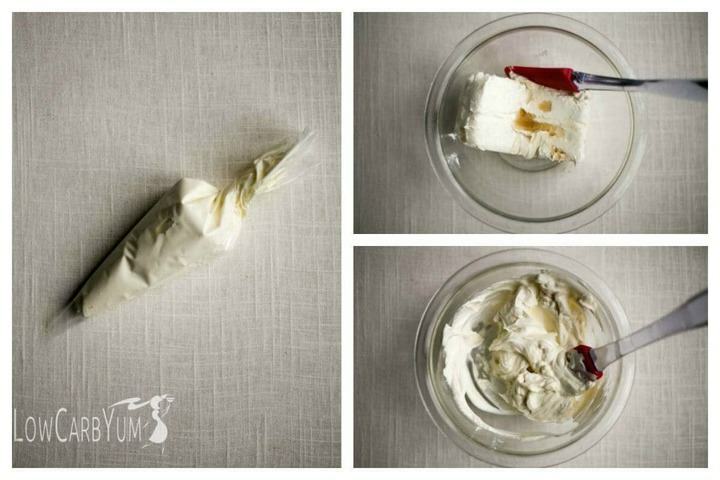 I’ve seen others use sour cream in place of cream cheese so you could try that. Greetings!!! I am looking forward to making these but wish to share with my dear friend who is allergic to corn, she is concerned about the cream of tartar in this recipe. What would you suggest to make this and make it safe! You can get corn free cream of tartar. If I use the extra egg yolk, can I then use the leftover egg white on the circumference to crisp & gloss? By the way, I make my own EVERYTHING bagel Spice for my savory cloud bread. It sounds like it should work okay. And, the bagel spice sounds like a great add to cloud bread. I made these and they are wonderful. Can you tell me how they add up for the egg fast day. I had two. Thanks!! The carbs are so low, it’s fine to have more than one on an an egg fast day. These are amazing!! Thank you so much! I added a little extra coconut flour and some baking soda and I think it really added to making it more bread like. Also appreciate that it is very simple and uses ingredients that we had at the house!! I would love this for breakfast! I’m a fan of monkfruit sweetener for coffee, but haven’t used it much in cooking. Would love to experiment more with it. It’s a much better sweetener taste-wise than stevia. And, I love that it’s not a sugar alcohol and has zero calories! Made these tonight and they are fantastic! I modified it a bit…my family does not like stevia so I used EzSweet Sucralose drops and some Splenda. Next time I will try xylitol and the EzSweet to eliminate the extra carbs from the powdered Splenda. I did not add the egg yolk to the filling and I sweetened the filling with Torani Sugar Free Classic Hazelnut Syrup. I also added about 1 tsp of Torani and 1 tsp vanilla and some cinnamon to the bread batter. I only had zero carb vanilla whey powder so that is what I used. 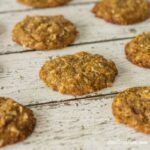 These will become a regular part of our low carb lifestyle! They are fantastic! Glad they worked out for you! How do these hold up after being refrigerated? I want to make them and eat them for breakfast in the mornings. I know the original cloud bread recipe is fine the next day or two. They hold up better than cloud bread in my opinion. I made these today, and it is the first time that my husband had enjoyed a carb free bread option. I made a couple of changes (actually additions) that my husband really enjoyed. My favorite pastry (before I started this WOE) was a good Bear Claw, so I thought I would try some of the same flavors. I added a tsp of Almond Extract to the dough, and then did as a previous commenter suggested and spiraled the cheese through the dough. I placed some raw sliced almonds on top, before I placed them oven. After they cooled I brushed on 2 layers of a glaze made from a Stevia baking blend, cream and a little vanilla (be careful, too much of the stevia tastes bitter) The almond slices added a little bit of crunch that the cloud bread misses. Thanks for posting your recipe. I am already trying to figure out out I can turn this into a cheesy, garlic herb bread. Wow! That sounds super delicious! I don’t think it would be too difficult to make a garlic herb bread. There are a lot of variations of the Oopsie Rolls at the Lighter Side of Low Carb, but I don’t recall seeing that one. 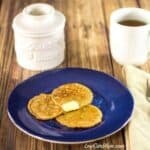 I used this Italian seasoned Cloud Bread recipe last night in my first attempt making Cloud Bread. It was fabulous. I found it at A Spicy Perspective. I appreciated the simple ingredients, I already had. This was the first bread type product I’d eaten since 1/23, having ditched all processed carbs for Keto. I’ve changed my eating for life. I may not remain Keto, but I will remain low carb, whole carb, whole food,processed food free for life. What a nice treat for breakfast! I just made these and they look beautiful. The addition of the coconut flour did give them more texture. I added a tblsp of Truvia brown “sugar” to the cheese filling and the one egg yolk. I put the extra white in with the other whites for the dough. They do tend to spread, so no more than 6 per lg cookie sheet. I think I will spiral the cheese mixture onto the dough next time so every bite has some. This is one I will make again! Thanks. Good idea for spreading out the filling! 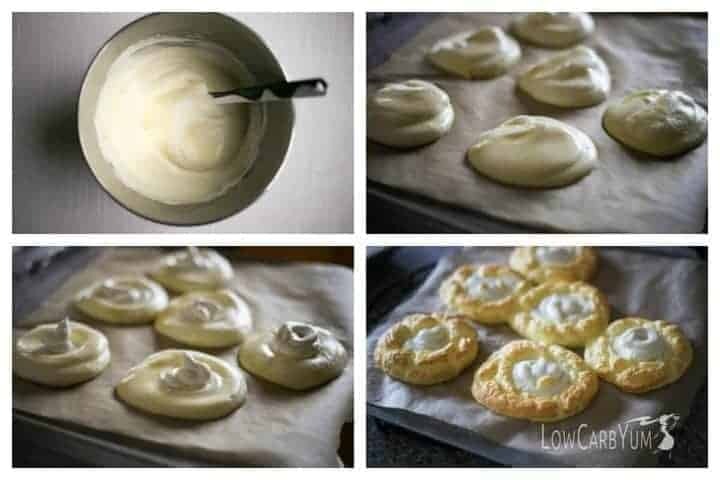 Just made these.. Super easy and good, only used a pinch of stevia… I wonder if you could put lemon juice in cream cheese for additional flavor Danish.. Lemon juice or extract would really enhance the cream cheese centers! This might be a silly question, but does the 8oz of cream cheese go in the dough or the filling? The sweet leaf vanilla stevia is the same as the sweet leaf liquid vanilla cream? I always just call it vanilla, but it is vanilla creme on the label. It’s the only vanilla flavor they have as far as I know. Fixed. The dough is not very sweet. The larger amount of stevia is for the cheese filling. I just made these with all of the optional ingredients, but I didnt have vanilla stevia so i subbed with a half vanilla and half stevia mix. The pastry part was a little bit bland for my taste so I topped them with a mix of 4oz cream cheese, 2 tbsp powdered erythritol, 2 tbsp hwc, 1 TSP vanilla and they are awesome! Thanks for the feedback on what you did and how it came out! I may give it a try! I would only add a tablespoon or so of coconut flour. As for baking soda, I’d try a half teaspoon or a bit more. Added carbs would be less than a gram per danish.